Maryland offers amazing options for bicyclists: The Appalachian Trail, the Baltimore Waterfront Promenade, Gunpowder Falls State Park, the Baltimore-Washington Trail and countless others offer some of the best bike paths on the Mid-Atlantic. If you are a regular cyclist or one of the 50,000 people injured in bicycle accidents every year, you know that drivers and even pedestrians often struggle to see bicyclists to avoid a collision. Then you throw in poorly kept roadways and paths and dogs trying to chase you down... riding a bike in some areas of Maryland can be like navigating a minefield. In most of our cases, the biggest element of damages is pain and suffering. Why? Because in serious injury and death cases, the most serious harm is the physical and mental suffering, not the medical bills and lost wages. Below is a list of bike accident settlements and verdicts in and out of Maryland. First, a few thoughts on these results. Serious bike accident cases usually settle out-of-court. The ones that do go to trial are generally smaller cases. 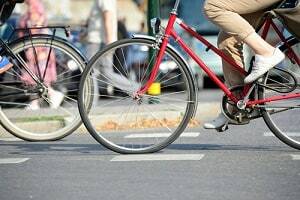 Our law firm also settles most of its bike accident cases and most of its cases in general. That said, we don't settle for less and every major insurance company in Maryland knows this. Why do we publish these? While two claims are never the same, the lessons learned about the value of cases does inform our value of new cases. This is more so with respect to the type of injury then the type of accident. But both are instructive. That said, these verdicts and settlements and any that you see or hear about need to be swallowed with a grain of salt. No two cases are alike and the results of one case does not predict the results of another. Nor does the fact that a lawyer has a history of getting great verdicts mean they will continue to do so in the future. Another thing to keep in mind is the importance of venue. We would like to think that juries give equal justice across Maryland. But they don't. The value of a case in Baltimore is substantially more than the exact same case on the Eastern Shore. 2013, Baltimore County, Maryland: $90,000 Verdict: Plaintiff, a doctor, and three others, are traveling in a straight line on Cold Bottom in Sparks, Baltimore County. They were approached by the Defendant Driver in an SUV. Though never striking the bikers, Defendant traveled so unsafely close that he startled the men, causing the Plaintiff to fall from his bike and sustain injury. The Plaintiff, first in line, hit his head with such force that it cracked his helmet. He sustained a concussion, and injured his right shoulder and clavicle, left wrist, right elbow, and both knees. Due to his head injury, Plaintiff had only snap shot images of being on the bike ride prior to the accident, and had no recollection of the incident or the twenty-four (24) hour period preceding the accident. Plaintiff filed suit against the driver and the owner of the vehicle. The Defendant Driver claimed that the Plaintiff was wobbling on the bike as he approached, and that the Plaintiff was the cause of his own injuries. The case, tried on liability only, resulted initially in a hung jury. A second trial resulted in a Plaintiff’s verdict and an agreed upon damages cap of $90,000. The owner of the SUV was dismissed prior to the trial. Miller & Zois handled this case. 2013, Ohio: $24,653 Verdict: A 71 year-old man was riding his bicycle on the sidewalk of Ridge Road. As he approached its intersection with Snow Road, he was struck by a minivan that was attempting to make a left turn into the center lane. The man was taken by ambulance to Parma Hospital and was treated for a left shoulder contusion and a torn rotator cuff. He sued the driver of the minivan for motor vehicle negligence, claiming that he was in the crosswalk and had the right of way; that the defendant had failed to yield. The defendant denied liability, arguing that she had lawfully entered the intersection and appropriately established her lane of travel. Defendant claimed that the plaintiff had rode his bike into her vehicle and failed to maintain proper lookout while attempting to use the crosswalk. The arguments continued to a Cuyahoga County Court where a jury found on behalf of the plaintiff. They awarded him $24,652.66 in damages. 2013, Virginia: $100,000 Settlement: A young woman was leaving her job as a waitress one evening. As she was riding her bicycle home, she approached the intersection of River and Bridgeway Road. Unfortunately, she was struck by an SUV the moment she reached the intersection. The force was so strong that her body hit the windshield and she fell to the ground. The driver of the vehicle did not bother to stop and help the woman and merely drove away as if nothing had happened. Consequently, the cyclist, who was only 24 years-old, died at the scene. The driver did decide to turn himself in to the police the following day, claiming that he initially was under the impression that he hit a deer. Shortly thereafter he was charged and given a three year sentence for hit and run. 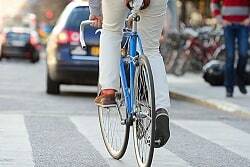 The cyclist’s estate sued the driver on the young woman’s behalf for motor vehicle negligence and wrongful death. They claimed that the defendant was reckless in the operation of his vehicle and intentionally left the scene knowing that she had been struck. While the defendant did not argue that he struck the plaintiff, he claimed that he did not see her as he approached her. Plaintiff’s counsel pointed out that the decedent’s bike was equipped with not only red reflectors and a flashing red light on the back, but also large white headlights in the front. Defendant’s insurance company, GEICO, agreed to settle on the matter with the plaintiff in the amount of $100,000. 2013, North Carolina: $45,000 Settlement: A local college student was riding his bike along a roadway in Mount Pleasant. As he began to approach the intersection, he saw that the roadway went from single lane to two lane traffic, with the right lane marked for right turning vehicles only. He shifted over into the right lane and saw a vehicle driving alongside him, approaching the same intersection in the left lane. As he approached the intersection, the vehicle made a sudden right turn and collided into the young man. He was transported to an emergency room where he was treated for a fracture of the left elbow. Shortly thereafter he received open reduction surgery on the injured elbow and had to undergo post-operative physical therapy. He sued the driver for negligent operation of his vehicle. The plaintiff claimed that a driver in the oncoming section of the intersection had witnessed the collision and claimed that the defendant had cut off the plaintiff. Plaintiff claimed that he chose to move to the right lane because there was no designated bike lane and felt staying to the right would prevent any potential impeding of traffic. At the time of the accident, the right lane was marked by construction cones. Plaintiff’s counsel claimed that the municipal government indicated that the cones had been placed to prevent traffic from turning in the right lane, while defense counsel noted that a police officer had reported that the traffic cones were placed to prevent all traffic in the right lane. Several weeks before the scheduled trial date, the parties agreed to settle in the amount of $45,000. 2011, Maryland: $30,493 Verdict: A 53 year-old man was riding his bicycle during his lunch break in the right lane of a two-lane roadway in Howard County. Without warning, a vehicle began backing out of a private driveway, causing the man to slam into the rear of the vehicle. The man was hospitalized for two days where he was treated for three fractured ribs, a fractured collarbone and fractured pelvis. He sued the driver and his insurance company, Allstate, for failing to make a proper observation of her surroundings before backing out of the driveway. The defendant denied liability, claiming the plaintiff failed to yield to her turning vehicle. They brought their cases before a Howard County jury who found in favor of the plaintiff. They awarded him in the amount of $30,493. You can also find some interesting statistics on the chances of winning two wheel - bicycle and motorcycle - injury cases here. Our law firm handles only serious injury and wrongful death claims for plaintiffs who need serious legal representation. If you want someone who will fight to maximize the value of your claim, call 800.553.8082 or get a free on-line consultation.